I suppose I could have worded the title differently, but it works. As if flipping a house isn’t enough, our home has been under constant renovation since we first purchased it. We’ve got a long way to go and the next project on deck is the full bath on the third floor. It’s literally gone untouched since we first bought our home, other than being a storage area for random junk. 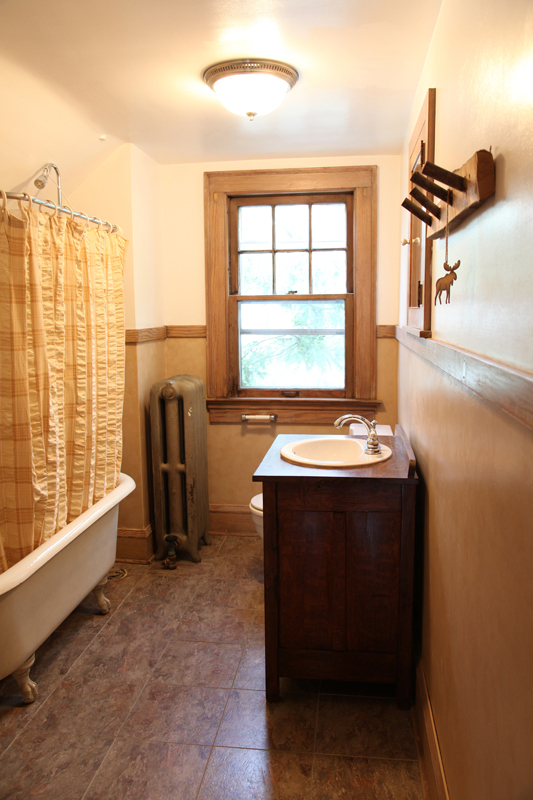 We don’t use it, even though it has a beautiful cast iron clawfoot tub that is original to the home. 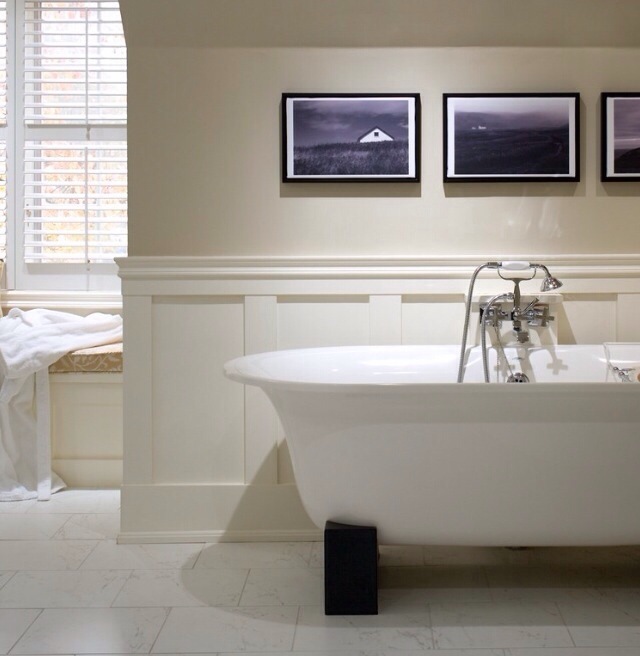 And they’re not cheap…a tub similar to ours retails for $4500 at Restoration Hardware. Here is the third floor bath when we first bought the house…aside from removing the radiators (we had a central heat/air installed), the bathroom looks exactly the same. Yes, even that ugly shower curtain and the A&F Moose hanging from the “towel rack.” Our third floor is a perfect example of “out of sight, out of mind.” It’s dark, ugly and uninviting. Aside from the need for a good paint job, I have quite a bit of work ahead of me. 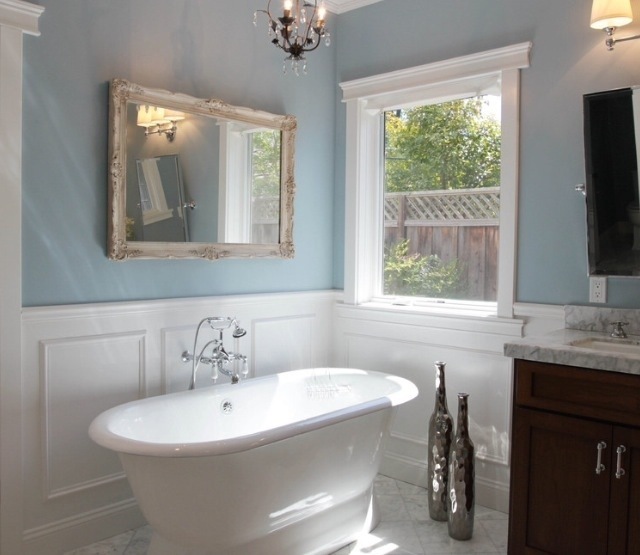 While I appreciate the value a fully renovated bathroom can add to a home, we’re on a budget. Ideally, I’d like to dedicate less than $500-750 to the renovation, the bulk of which will be spent on a new vanity and flooring. Despite the tight budget, I do want to give the bathroom a warm and classical look, which really can’t be achieved by just painting the walls. With that in mind, my wife suggested the use of wainscoting, using the pictures below as inspiration. It’s an aesthetically appealing, easy to install and period-appropriate for our home. While I’m a fan of the more neutral tones in the first picture, my wife is far less bland and prefers a more lively and bright environment. Since this will be her space, we’ll likely opt for a more calming and bright paint. The baby blue screams Southern Charm (in Cleveland? ), which is exactly what this space needs. To be clear – that’s not wainscoting. It’s beadboard. And I hate it. Unless you own a beach house in Nantucket, this shouldn’t be in your home. What I do love about this bathroom, however, is the use of Hex tiles. They’re clean, traditional and typically very well priced at $4-5 per square foot. 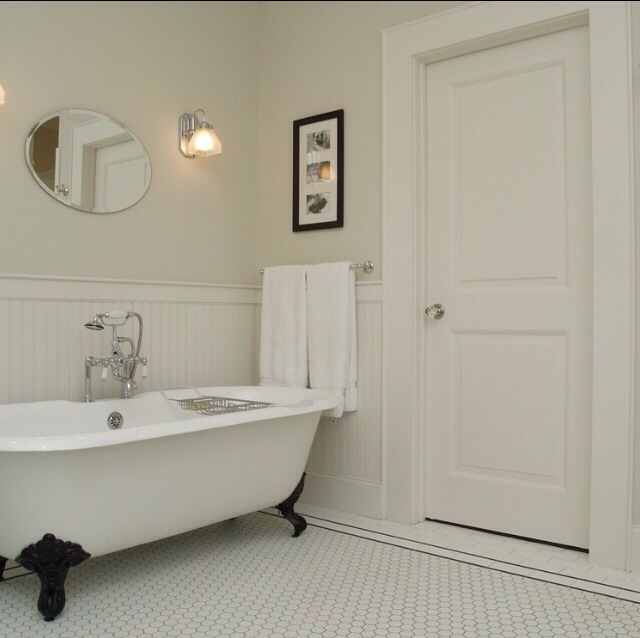 I also love the contrast between the white tub and black feet, which I may recreate should we choose to install white tile. So, there is my idea-book. The first step is to tear out the floor, trash the shower curtain and put the A&F moose in a more appropriate location. All told, I would expect this project to take 2-3 weekends as I work in piecemeal. One weekend for the wainscoting and paint, one weekend for the vanity and flooring and one weekend for paint. So, hopefully my wife can take a nice bath by late April. Maybe. Hopefully.